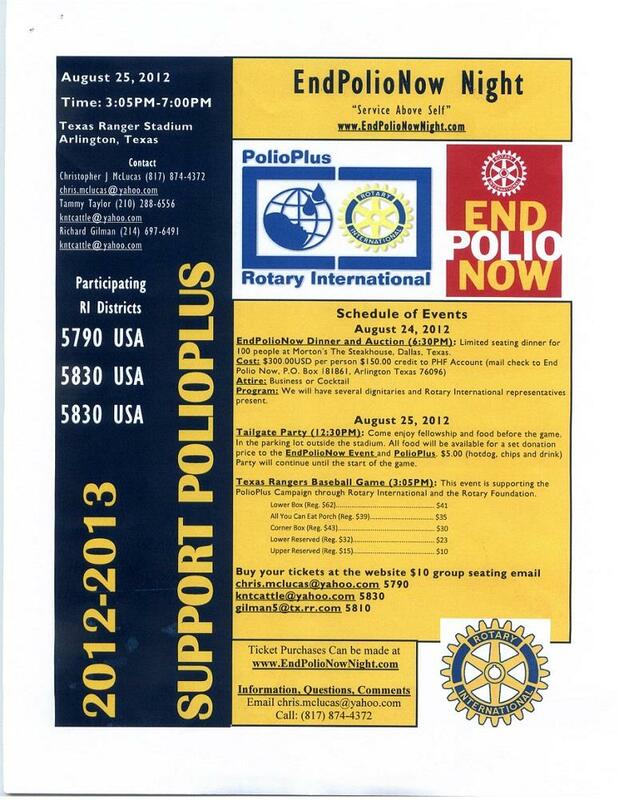 Local Rotary International district 5790 will be participating in two events to raise money for the fight against polio. The first event, EndPolioNow Dinner and Auction, will be held Friday, August 24, 2012 at Morton's The Steakhouse in Dallas at 6:30 pm. There is limited seating for 100 and the cost is $300 per person for dinner. Of the $300, $150 will be credited to that Rotarian's PHF account. The next event is on Saturday, August 25th. It begins with a tailgate party outside of Ranger stadium at 12:30 pm. For a $5 donation participants can receive a hotdog, chips and drink. The party will continue until the start of the game. Tickets for the Texas Rangers baseball game, which begins at 3:05 pm, will be offered at discounted prices and will benefit the PolioPlus Campaign through Rotary International and the Rotary Foundation. More details for each of the events can be found on the attached flyer.